“Our Indian farmers are progressive but they do not have the access to technology and lack intrinsic information on our ancient farming practices as well as latest update on government farming policies. 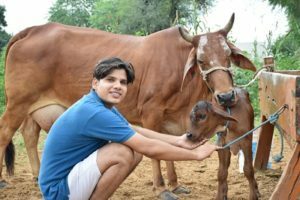 We are trying to bridge the gap by working on the constraints existing before the farming community,” asserts Mr. Pawan Sharma and Mr. Ayush Agrawal, founders of Kaushal Gram. Both young men in their 20s are quite moved with the problems faced by Indian farmers. Besides they aspire to see India attaining remarkable position on world map in agriculture domain. Therefore irrespective of having a time-intensive career in IT field they are working hard during the weekends to turn farmers healthy and wealthy. Mr. Sharma is based at New Delhi while Mr. Agrawal at Gurgaon yet they are working extensively with farmers located in the remote areas of Rajasthan, Uttar Pradesh, Himachal Pradesh, Haryana and Uttaranchal. Kaushal Gram is a self-funded start-up of Mr. Sharma and Mr. Agrawal. It was started in 2015 to provide free-of-cost training to farmers on natural and organic farming practices, research and develop low-cost technology to enhance farm productivity and improve farmers’ income by engaging them in value addition of their farm produce with the assistance from self-help groups. With their sincere efforts they were able to bring positive impact in the life of 30-40 thousand farmers in the five states (mentioned above) yet they wanted to reach the farmers across the country! 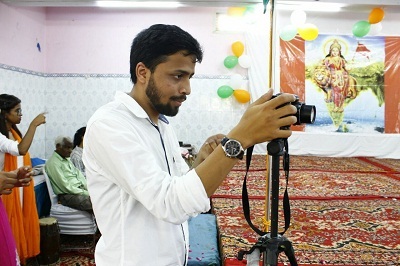 Therefore they created informative videos and uploaded it on youtube channel and shared it on their portal http://www.kaushalgram.org/ . These videos are available to all free-of-cost. Consequently they could indirectly help more than 1.5 lakh farmers. The numbers are increasing every day. “The videos feature success stories of farmers who have attained bumper crop on their respective fields with natural or organic farming inputs. We insisted on featuring these farmers because seeing is believing and it inspires other farmers to take the steps towards positive change,” shares Mr. Agrawal. Use of technology is mandatory in farming and farmers want to adopt the same but all the available solutions are very expensive. Young men understood the plight of small and marginal farmers in respect to financial constraints therefore they researched and developed affordable alternatives to the same technology. “We have developed a bio-gas unit that can be installed at Rs. 5000 only. It provides cooking fuel for 20-30 minutes and slurry is flown to the farm irrigation system so that it can be used in the farm,” elaborates Mr. Sharma. Another technology discovered and introduced by Kaushal Gran is ‘drip irrigation with waste silicon tube and pipes along with waste plastic bottles’. “The tubes, pipes and bottles are connected to the plants in a systematic manner that water droplets keep the soil moist and fulfill the water requirement of the plants. It not only saves the water but also the cost as it is installed at negligible cost” he explains. One more low-cost technology invented is ‘solar drier’. It is sold at the price as low as Rs. 2000-4000. It is a 100kg capacity solar drier that works well during winters at 30-40o C while in summers at 70-80o C. It is used for drying herbs, flowers, leaves, grains and spices. Next they felt information on weather forecast and numerous agriculture related policies must reach the farmers so that they can be benefitted. Considering farmers are not tech-savvy and might not own a smartphone, “We both designed http://www.kaushalgram.org/ portal on our own. Once the farmers register their mobile numbers, call is given to them informing on central and state government agricultural policies and weather forecast. We also share the details on farming techniques and pest management. The call is made in their Mother tongue,” asserts Mr. Agrawal. “We are now working on a tool kit that would have 7-8 tools required for farming. It is designed for small farms. These tools will be sufficient in every way to make crop cultivation and harvesting easy for the farmer. Soon it shall be available to the farmers,” he adds. In time to come founders of Kaushal Gram want to scale up their operations by opening 100 new centers across Indian states. “We are working for the farmers and with the farmers. Presently we operate from 10 centers in five states in North India. We want to open more centers. If any farmer in any state is interested to join in the movement then they can contact us. We will provide them training and material to train their fellow farmers,” highlights Mr. Agrawal. Mr. Pawan Sharma did Mechanical Engineering from NIECI and pressently working at Nasscom Foundation as a project consultant. Mr. Ayush Agrawal studied Civil Engineering from IIT Delhi and is working at Policy Bazaar as as a data scientist. They both share a common goal to let the farmer stand high with dignity.